So, since I am working through a large batch of Mini-Maidens that I drew all those months ago, I can safely say this it the last “summery” fashion collection for them I have for the moment. I’ll need to draw some more for the Mini-Maiden paper dolls really soon. I’ve got Ms. Mannequins and Poppets in the works, but Mini-Maidens need love as well. Anyway, summer has left Alabama, though it is still in the 60s. It does drop down at night, but I’ll openly confess that the weather is really mild compared to what I saw in Alaska. I am going home soon and am not looking forward to returning to below freezing weather. I own no clothing that works for weather that cold. I dug my only wool sweater out of my closet earlier. I haven’t worn it in, I am not kidding, five years. I digress. 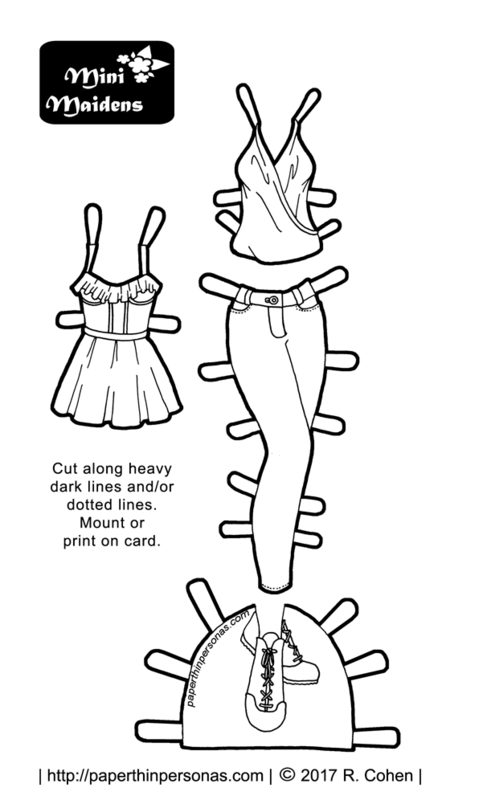 I wanted to design these clothing pieces to slide perfectly into the wardrobes that you can create with my other contemporary Mini-Maiden paper doll fashion sets. I was thinking this set and this set, this older set or this older set. As always, I love to hear comments or, if you’d like to support the blog further than become a patron.